Following the in the footsteps of the successful ‘Soils for arboriculture’ workshop developed and delivered for the Arboricultural Association since 2016, Andy Moffat has been asked to deliver a similar course for foresters. 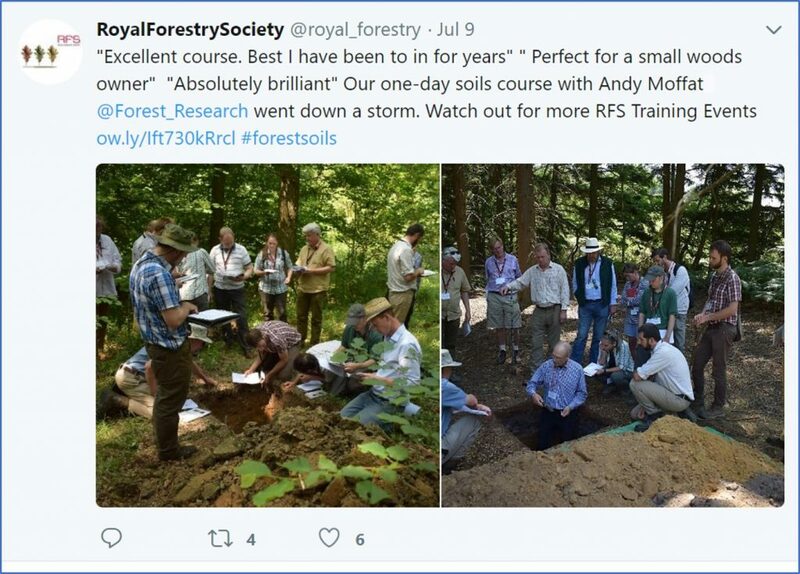 This time the Royal Forestry Society is interested in giving foresters first-hand training in soil type recognition in order to help in decision-making which depends on or affects the soil, such as tree species choice or harvesting. Training will also be given in how to use soil information to input into the Forestry Commission Ecological Site Classification system. The one day workshop was held at the Forest Research Alice Holt Research Station in Surrey on 28th June 2018. Feedback from course participants was excellent (see below) and there are already plans to hold another course in 2019.